Did Tiger’s Reading Save Par? Discuss. I’m still digesting Tiger’s thirteen-and-a-half minute surreal statement, so please accept my preemptive apology for what I assume will be incoherent and incomplete thoughts. Tiger walked out with bloodshot, teary eyes to a crowd that looked like they were there for an execution or a funeral, including his mortified mother. Was he peeling onions backstage? Or were those sincere emotions? But I give him credit for standing up there and admitting guilt. It was clearly hard for him. Words like “selfish,” “irresponsible,” “foolish” and “embarrassed” were thrown around generously. I stopped living by the core values that I was taught to believe in. I knew my actions were wrong, but I convinced myself that normal rules didn’t apply. I never thought about who I was hurting. Instead, I thought only about myself. I felt that I had worked hard my entire life and deserved to enjoy all the temptations around me. I felt I was entitled. Thanks to money and fame, I didn’t have to go far to find them. He spoke like a rigid robot with a hint of humanity. He stumbled over his words, got choked up and fought back tears. He looked frustrated, humiliated, apologetic and a little angry. But there was still a phony feel as he recited words from the script, especially in the controlled atmosphere. Some have written things about my family. Despite the damage I have done, I still believe it is right to shield my family from the public spotlight. They did not do these things; I did. Part of following this path for me is Buddhism, which my mother taught me at a young age. People probably don’t realize it, but I was raised a Buddhist, and I actively practiced my faith from childhood until I drifted away from it in recent years. Buddhism teaches that a craving for things outside ourselves causes an unhappy and pointless search for security. It teaches me to stop following every impulse and to learn restraint. Obviously I lost track of what I was taught. Huh? I assume that was a response to Brit Hume’s absurd advice when he suggested Tiger turn to Christianity for salvation because Buddhism doesn’t offer enough forgiveness and redemption. Or Tiger was just hitting a rehab talking point. I don’t remember anyone outright saying he actually used steroids — The NY Times article reported the doctor that treated him post-knee surgery was charged with prescribing patients with performance-enhancing drugs. Perhaps some made strong suggestions. I credit him for admitting guilt. At times he seemed genuinely apologetic, but then the speech was strained and robotic. As for golf, he left it open-ended, saying he’ll return when he’s ready — which surprised me. I thought for sure he’d be back for The Masters. So maybe he’s sincerely trying to change and work out his family life. Whether or not Elin decides to stay with him is between the two of them. But he deserves another chance and forgiveness from the public, which I believe will come when he returns to golf and wins majors. But before that, he needs to answer the tough questions (not sordid details about his affairs). He needs to sit down with an interviewer and have a discussion. Oh, the Sporting News Radio just called. My marathon begins. So I’ll leave it to you to discuss your reaction to this morning’s events. 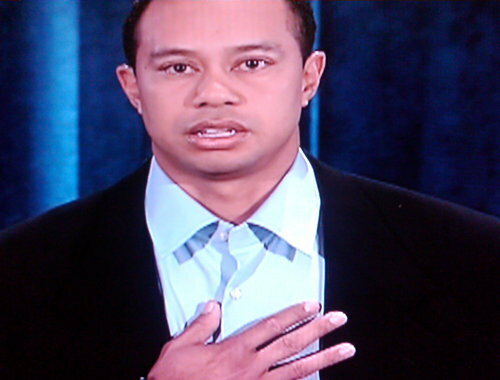 How do you grade Tiger’s scripted statement? Was he sincere?